We're past the 3/4 mark of the season might as well kick off this nonsense. Think Harden has this wrapped but if Brow stays hot like this and they wrap like the 3rd seed he could make a case. Curry has a long shot if he turns it up just a hair more and they re-take the one seed, think harden would have to regress a bit and/or get injured tho too. Dont think any of the others have a real chance at this point and curry/brow is more of a long shot. roberson would probably have won it but seeing how bad they are w out him has upped his stock a ton. im not even sure who else is in the hunt? gobert missed too much time prob. durant had some traction to start the year but he's been on cruise control in 4th gear for a while now. i stan for roberson but i think he will miss too many games this year to get the award. Kinda hearing some mcmillan talk for coy, not like he should be #1 but may be worth a few top 3 votes. He’s def surprised me. I voted Harden MVP. He's been a bridesmaid several times now and set himself up to win this time. Brow ought to pick up a few votes from Harden haters. LeBron will get his votes from his devotees, but... (shrug) nah. he was for a while but they kinda reversed about halfway through imo. KD been a little more lax and dray's turned it up. kyle anderson is a steals maniac, good shot blocker too. wonder what kind of defensive numbers he would put up if he played starter minutes. van vleet should be in the 6man running altho i don't think he has the raw stats for it. he plays in crunch time for the 3rd best team in the league and that should count. James Harden doesn’t want any DNP-rest nights down the stretch of the regular season. “I’m good, I wanna play,” Harden said. just think maybe he should be focused on not breaking down in the playoffs again. except wheen they're outlaws. because....then theyre out. The @cavs 10 games better than the @celtics? Hard to see how that's possible. Let's revisit this in the spring. i'd prob vote simmons but that's an undersell of mitchell. if he gets to the line a bit more and gets a little more accurate from 3 he's going to be as good at scoring as any guard in the nba outside the top 4 or so. I’m more and more convinced that an MVP vote for lebron is basically indefensible. i'm disinclined to reward any of the coaches that ended up in the 3-8 western conference mess with a CoY vote. In a vote of his peers, Dwane Casey of the Toronto Raptors has been selected as the National Basketball Coaches Association’s coach of the year for the 2017-18 season — while Brad Stevens of the Boston Celtics stunningly failed to win a single vote from fellow coaches. First team: Rudy Gobert, Anthony Davis, Victor Oladipo, Jrue Holiday, Robert Covington. 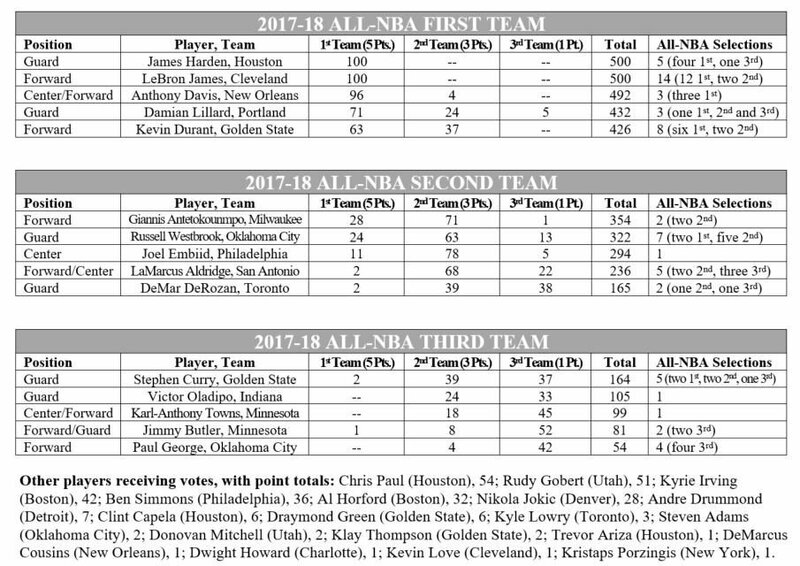 Second team: Joel Embiid, Draymond Green, Al Horford, Dejounte Murray, Jimmy Butler. heard rumblings of his defense being amazing this year. covington over draymond seems a little suspect to me. but fair enough, he deserves a lot of credit and dray was cruising at 80% all year. On the bright side, we don’t have to hear about Dame not getting any respect ever again. don't understand how KAT could make it after the year he's had. who's out here voting for TREVOR ARIZA for all-nba?